I am a life-long fan of the Philadelphia Eagles. This has not always been a joyful endeavor, especially during seasons filled with disappointments, injuries, and without Super Bowl victories. That is, until February 4, 2018, when, in a state of disbelief, I watched as we won Super Bowl LII. The celebration of that victory still feels like it is alive and ongoing within my heart today, even though this season has already ended without a championship. Yet, as a fan, I am already looking forward to all the great possibilities of the 2019 season. No matter what, I believe in this team and I will always cheer them on. I am also a fan of the Church. This has not always been a joyful pursuit. There have been disappointments along the way, people have been hurt, and we have not yet seen the kingdom being fully fulfilled with Christ’s return. We often get side-tracked from pursuing the main purpose of the church by our personal preferences as to how the church should look and what its focus should be. We are called to proclaim and to be a sign of the kingdom of God through our worship, discipleship, and life together. I long for the possibility of the church being “all together in one accord” (Acts 2) so that the Spirit can fill us anew. Yet despite its shortcomings, as a fan of the church, I always have hope. 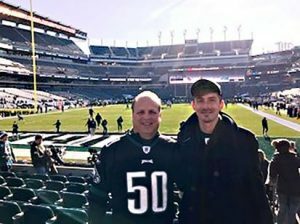 This fall, my son and I had an opportunity to attend the Eagles/Texans game at Lincoln Financial Field. It was a close game that the Eagles eventually won. But what I noticed, as I sat amidst 65,000 fans, was that we were “all in one accord.” The fans sitting around me were women and men, young and old, and from every ethnic background possible. We did not always agree on what plays the Eagles should call, or what players should be on the field at a certain time, but we cheered together with passion and energy. We all were seeking the same result—a win. 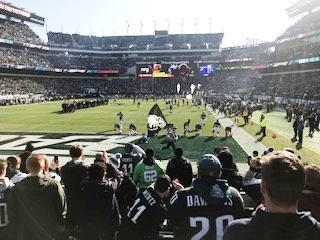 So we cheered together at good plays, booed together when we felt that the officials were not treating our team well, and sang the Eagles’ fight song together after each touchdown. We even hugged and high-fived complete strangers, because, at that game, the differences between us did not matter at all. We were simply expressing ourselves as fans of the Eagles. As I think of the new 2019 “season” of the church, I also have the same feeling of positivity. There are many things happening, both in our individual churches as well as within the Franconia Conference—things I am hopeful and excited about. My prayer is that, as fans of the Church, we can spur one another on as we passionately celebrate, together, what God is going to do.